At least 15 explosive eruptions from the Katmai cluster of volcanoes and another nine from other volcanoes on the Alaska Peninsula are preserved as tephra layers in syn- and post-glacial (Last Glacial Maximum) loess and soil sections in Katmai National Park, AK. About 400 tephra samples from 150 measured sections have been collected between Kaguyak volcano and Mount Martin and from Shelikof Strait to Bristol Bay (∼8,500 km2). Five tephra layers are distinctive and widespread enough to be used as marker horizons in the Valley of Ten Thousand Smokes area, and 140 radiocarbon dates on enclosing soils have established a time framework for entire soil–tephra sections to 10 ka; the white rhyolitic ash from the 1912 plinian eruption of Novarupta caps almost all sections. Stratigraphy, distribution and tephra characteristics have been combined with microprobe analyses of glass and Fe–Ti oxide minerals to correlate ash layers with their source vents. Microprobe analyses (typically 20–50 analyses per glass or oxide sample) commonly show oxide compositions to be more definitive than glass in distinguishing one tephra from another; oxides from the Kaguyak caldera-forming event are so compositionally coherent that they have been used as internal standards throughout this study. Other than the Novarupta and Trident eruptions of the last century, the youngest locally derived tephra is associated with emplacement of the Snowy Mountain summit dome (<250 14C years B.P.). East Mageik has erupted most frequently during Holocene time with seven explosive events (9,400 to 2,400 14C years B.P.) preserved as tephra layers. Mount Martin erupted entirely during the Holocene, with lava coulees (>6 ka), two tephras (∼3,700 and ∼2,700 14C years B.P. ), and a summit scoria cone with a crater still steaming today. Mount Katmai has three times produced very large explosive plinian to sub-plinian events (in 1912; 12–16 ka; and 23 ka) and many smaller pyroclastic deposits show that explosive activity has long been common there. Mount Griggs, fumarolically active and moderately productive during postglacial time (mostly andesitic lavas), has three nested summit craters, two of which are on top of a Holocene central cone. Only one ash has been found that is (tentatively) correlated with the most recent eruptive activity on Griggs (<3,460 14C years B.P.). Eruptions from other volcanoes NE and SW beyond the Katmai cluster represented in this area include: (1) coignimbrite ash from Kaguyak’s caldera-forming event (5,800 14C years B.P. 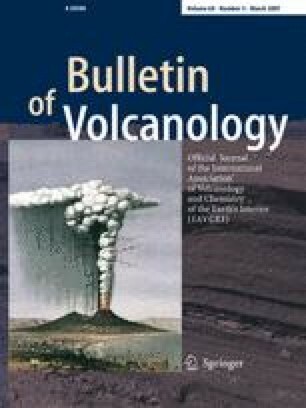 ); (2) the climactic event from Fisher caldera (∼9,100 14C years B.P.—tentatively correlated); (3) at least three eruptions most likely from Mount Peulik (∼700, ∼7,700 and ∼8,500 14C years B.P. ); and (4) a phreatic fallout most likely from the Gas Rocks (∼2,300 14C years B.P.). Most of the radiocarbon dating has been done on loess, soil and peat enclosing this tephra. Ash correlations supported by stratigraphy and microprobe data are combined with radiocarbon dating to show that variably organics-bearing substrates can provide reliable limiting ages for ash layers, especially when data for several sites is available. Many thanks to the Alaska Volcano Observatory for providing funding and logistical support, with John Paskievitch arranging sometimes challenging helicopter logistics. The US Fish and Wildlife Service bunkhouse was a welcome base for helicopter-dependent fieldwork and pilot Sam Egli was a pillar of calm in the Alaskan winds. Geochron Laboratories did all the processing and dating of the radiocarbon samples, and Robert Oscarson kept the USGS microprobe running smoothly. Helpful reviews by Wes Hildreth, Kristen Manies, Vera Ponomareva, Kevin Scott. Chris Waythomas and John Westgate improved the manuscript. I am especially grateful to Wes Hildreth for encouraging this work, for his companionship in the field, and for his perspectives that engendered discussions that enhanced the manuscript.